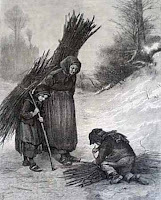 "Such of them as are too poor to lay in a sufficient stock of wood, find plenty of work in ascending into the mountainous woods, and bringing thence fuel. It would astonish the English common people to see the intense labour with which the Germans earn their firewood. 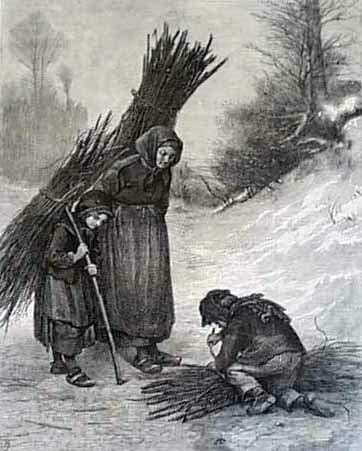 In the depth of frost and snow, go into any of their hills and woods, and there you find them hacking up stumps, cutting off branches, and gathering, by all means which the official wood police will allow, boughs, stakes, and pieces of wood, which they convey home with the most incredible toil and patience. There is not an hour of that year in which they do not find unceasing occupation. In the depth of winter, when the weather permits them by any means to get out of doors, they are always finding something to do. Of their in-door employments we shall speak elsewhere. They carry out their manure to their lands while the frost is in them. If there is not frost, they are busy cleaning ditches, and felling old fruit-trees, or such as do not bear well. Early hours and simple living distinguish the Germans. Three meals a-day are the usual order. The common people are astir extremely early, especially in summer, when wagons and carriages begin to roll about at two o'clock; and after that time, every hour becomes more lively with the country people proceeding to the town with articles for market. The cooks and good housewives are off to market to make their purchases for the day at five and six o'clock. The peasant girls, of course, before that hour, are going along in streams, with their tubs or baskets on their heads, full of vegetables, eggs, milk, fruit, etc. "